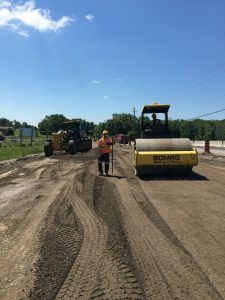 Regional Road 124 and Kossuth Road Roundabout - Capital Paving Inc. 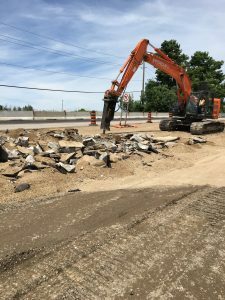 Regional Road 124 and Kossuth Road is a straight road and in order to create a roundabout the project must be completed in stages. Currently, we have constructed a by pass lane so southbound traffic can still make a right turn onto Kossuth Road. Kossuth Road heading down to Regional Road 124 is currently closed. 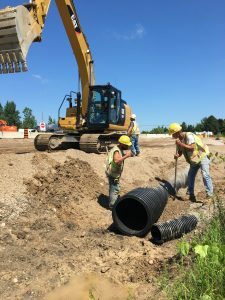 Completing the project in stages allows us to now drive traffic on Regional Road 124 to the east or west, ultimately allowing us to build the right and than left portions of the roundabout. 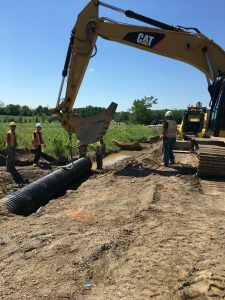 The job consists of removing all existing hard surfaces, excavated and replacing sub grade material, and adding new storm water drainage systems with culverts and sewers.